Combining "OUR VOICI" ami "FEDERATION REPORTER"
he has no plans to reapply for their credit carda. goods Mobil cannot import to Arab countries. were opposed to any anti-boycott legislation. Herat, like many Jews "smeJled smoke. sit back and do nothing. I wanted further facia,"
racial group in America," Carter said. there are plenty of other credit cards I can get." crime in Israel is not the first. 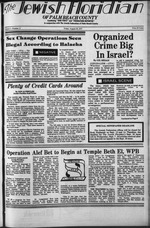 emergence of an Israeli "Mafia,"
that forced the police into action. that date will not appear in the Sept. 23 issue. day a week, two-hour session. be pace-setters for the nation." over a period of nine weeks. Sept. 30, at Temple Beth El. officers for the 1977-1978 year. Clubhouse on Sept. 1 at 8 p.m.
Thursday, Sept. 8 at 12:30 p.m.
hold its opening meeting on Sept.
Claire Braun or Sadie K neiberg. I at the Saxony Hotel. On Sunday, Sept. 4 at 9 a.m.
Fathers by Irving Howe; Jan.
advisor, will serve on the faculty. from the Beth El Men's Club. Tuesday, Sept. 6, at 1 p.m.
and the State of Israel. Jewish tradition. It is spacious and comfortable. the New York City Metropolitan area. teach the optional afternoon program held from 123 p. m.
have been our schools secret. a family at the school." tivities for each individual child. Afternoon Program: 12 noon3 p.m.
Secretary of State Cyrus Vance. power" in the Middle East. also seising to buy them. (D., Mass.) and Benjamin 8. Women's American ORT Evening 8 p.m.
Del ray Hebrew Congregation-Board-6 p.m.
Women's American ORT-Lake Worth-1 p.m.
Temple Beth El Sisterhood-Board-7:45 p.m.
Temple Israel Men's Club-6 p.m.
Jewish War Veterans 7:30 p.m.
Palm Beach Board -10 a.m.
Temple Beth Shoiom Sisterhood -12:30 p. m.
Hadassah Yovel Board -10 a.m.
Temple Beth El Sisterhood Luncheon 10 a.m.
Boca Raton Board -10 a.m.
Temple Shoiom Lake Worth Board 9:30 a.m.
Temple Israel Young Adults Board 8 p.m.
CemBtnina "OUt VOlCtejMlF DC RATION HI PORTER "
In conjunction with J* wish Federation of Palm Beach County. Inc.
1950's to settle in Beirut. the Arab stations was distorted. learned Israel had won the war,"
knew we would be in trouble." which they will never be unravelled. A Fedorenko they do not need in their midst. Aesop's fable that the entire experience implies. doesn't help us believe that. action in the Middle East. remarks on the political process. of something else. Not Winston Lights. numbers, you're smoking the wrong cigarette. tin peace in Arab lands? moves toward a peace conference. wide musical and variety show. areas they had to choose from." at the University of Toledo. every Friday. 3:30 to 4:30 p.m.
Baubles, Bangles and Beads or. on Thursdays from 10 to 11 a.m.
in fast. Call for registration. Sculpture Garden in Palm Beach. 7700 and ask for transportation. Weinstein to enroll. Bring lunch. Beach and will return at 6 p.m.
and take out what you can use. The CSSC is open from 9 a.m.
of the B'nai Torah Synagogue. modern Jew need a synagogue?" man in ancient and later times. to thee to wife" (Deut. 21.10-11). she will; but thou shalt not sell her at all for money"
go, but the young thou mayeet take unto thyself"
upon thy house, if any man fall from thence"
enter into the assembly of the Lord" (Deuteronomy 23.3). unto thee by the way aa ya came forth out of Egypt"
his unique place in the cosmos. hubbub of the market place. is thus the first act of "work"
in the course of the weak to come. Summer Sabbath Services Friday at 8:00p.m. Sabbath services. Friday at 8:1 p.m.
Sobboth services Friday at 8:15 a m.
Doily Minyon at 8:15 a.m.. 1775 N.E. 5rhAve. Beach Gardens 321 Northloke p m Saturday ot 9 a m.
Blvd. North Polm Beach, Flo. dered during the Nazi Holocaust. will be completed this fall. of an immigrant child in Israel. > S* 'ig llie M) ; ,y. Room 12, Boca Raton, Fla.
OI Palm Beach County, Inc.
Jewish Community Day School of Palm Beach County, Inc.
survival and a better way oi life,"
facets of Jewish and Zionist life. qualify, coupon must be mpiltd. No phone colls please. Organized Crime Bigger in Israel Today? action of Federal Judge John F.
use them for elective abortions. AT THE same time, Mrs.
things in life that are not fair"
of your posture on this issue,"
bitter, more ugly for the poor. Mafia, then I have a problem. But I don't believe he is." these trees during her recent visit to Israel.